In Ohio there are two main groups of spiders that pose a potential hazard to humans; the recluse spiders and the widow spiders. The two species of recluse spiders found in Ohio (brown recluse - Loxosceles reclusa, Mediterranean recluse - Loxosceles rufescens) were both likely introduced by humans. Other common names for these spiders include "brown spiders" or "violin spiders." In Ohio, these species have been found only in or near buildings and they may not survive over the winter outside. As the name "recluse" suggests these are relatively shy spiders. Their thin tangle webs are found in the area near the retreat, and if disturbed the spider may rush out and bite. The recluse spiders are mostly a pale or reddish brown color, darker on the cephalothorax (front part of body) and legs. On very close inspection there is a violin-like pattern on the top of the cephalothorax. The spiders have rather long legs, often spread widely and they are adept at running sideways as well as forward and backward. Most recluse bites occur when the spider has taken up residence in a stack of cardboard or an article of clothing laying on the floor. As the person picks up the item, or puts on the clothing , the spider is crushed and may bite. The bite of recluse spiders is often not very painful at the time of the bite but the pain may become quite severe after a few hours. The injury is rarely life-threatening except when the victim is very young or aged. Of particular concern are the slow-healing wounds associated with the bites of brown recluse spiders. The hemotoxic venom of the brown recluse acts rapidly by restricting circulation in the capillary beds surrounding the bite and eventually leads to the death of nearby tissue. Surgery may be required to close the wound but is often not appropriate. 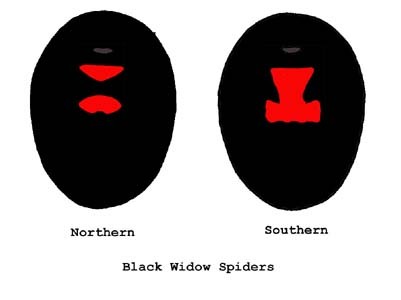 The black widow, Latrodectus mactans, and the northern widow, Latrodectus variolus, are both found in Ohio. Records are distributed across most of Ohio, but there are few records from the northwestern glaciated regions (areas covered by glaciers in the past). In Ohio, the black widow is most often associated with old abandoned buildings, wooden outhouses and barns. The northern widow may also make its tangle webs under rocks, logs, in cavities under cliff sides, and in shaded areas of woods. In both of the species, males and females look quite different, the larger females are shiny and black with a red hour-glass shaped mark under the abdomen, in the northern widow the middle part of the hour-glass mark is often missing so that these females appear to have two red marks. Some individuals may also have red markings along the back. Males are much smaller and lighter in color with a variety of red or orange marks, often outlined in white, on the abdomen. Bites are associated with females, males are not known to bite humans. In both species the bite can be serious. The actual bite may feel like a needle prick but eventually causes painful muscle spasms and cramps. Complete recovery is likely for healthy adults. There are a few other species of spiders which occur in Ohio that may bite. For most of these species the bite has few lasting effects. These include the introduced yellow or agrarian sac spiders (Cheiracanthium inclusum and Cheiracanthium mildei), the bold jumper (Phidippus audax), the parson spider (Herpyllus ecclesiasticus), Dysdera crocota (no common name), and the grass spider (Agelenopsis pennsylvanica). There are a few spiders which occasionally arrive with produce at the grocery store that are potential bite risks; huntsman (Heteropoda venatoria) and the banana spiders (members of the genera Phoneutria, Ctenus or Cupiennnius). The huntsman and banana spiders are relatively large and active spiders that are potentially dangerous but usually escape from humans without incident. As a result of modern produce handling procedures, these animals are very rarely reported in Ohio today.